Trolleys feature air-powered driving motor. 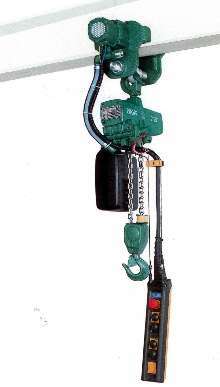 Motor Trolleys have compact design with hoist hook suspended and twist secured. They are easy to install and independent of beam flange width, which ranges from 50-200 mm. Twist bolt adjusts side plates and is secured by locknuts. Two-step motor produces low noise and allows lube-free operation, so no additional filter silencer is needed. ditional filter silencer is needed. Easy service and maintenance included. Together with the established JDN air hoists of the Profi TS series they streamline the flow of material - not only in hazardous areas. For further information please have a look under idn.de. Trolley Rail System aids heavy goods transport.